Moscow, February 24, Interfax - Patriarch Kirill's of Moscow and All Russia flight to Antarctica could have finished tragically: windshield of his aircraft broke down to pieces when he was leaving Chilean Punta Arenas Airport. “They reported that the collision was very dangerous, the cabin’s windshield had broken down to small pieces. It consists of two layers, and this first layer that can resist strongest blows, broke down to small pieces, the pilot said it was very dangerous and we had to return to Punta Arenas,” the patriarch told journalists, resuming the results of his trip to Latin America. On its way back to Punta Arenas after failing to reach Antarctica, the plane was flying rather low for a long time, so that the probable crash of the second glass would not lead to tragic consequences, but certain part of the flight was carried out at the height of 9,000 meters. 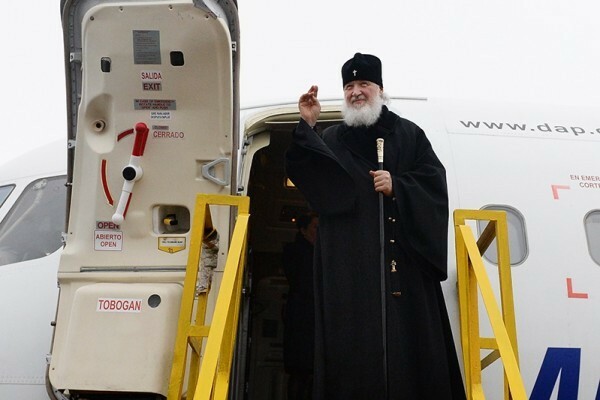 Then the delegation headed by the patriarch waited for the other plane, which managed to take them to Antarctica. “Certainly, it was a risky flight. (…) But I believe in God’s will. And then you have to remember that a person who gives his entire life to God, cannot, but believe in life after death. And if you believe sincerely, you feel it in a different way than a person who does not believe, especially when he leaves something important in this life. Then there can be hysterics, panic. And in fact panic is not allowed,” the patriarch said.